Every now and then a really innovative idea comes along and we are proud to offer this travel trolley to our clients. The trolley features a unique design that allows it fold up when not in use, making it compact and easy to transport and store. 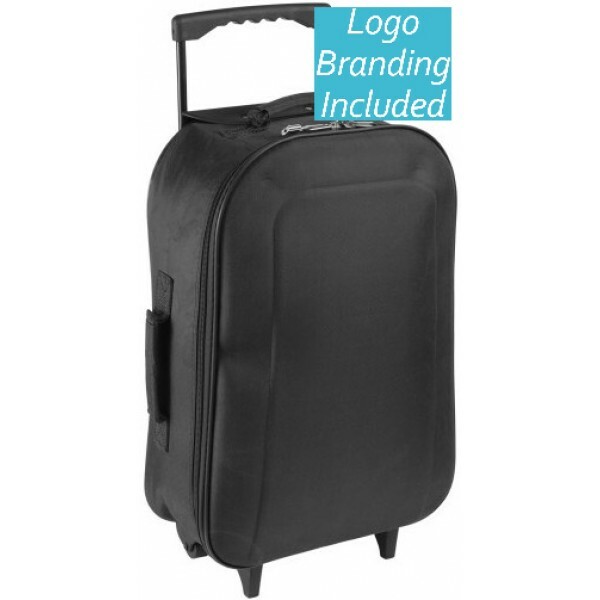 The case is manufactured from a strong and durable 600D polyester and comes in black. The case has two smooth rolling wheel at the base and an extendable handle on the top. Pull the handle out when you are ready to use the case and allow it to retract back into the body when not in use. If you want to carry the bag by hand you have the option of a carry handle on top. The inside of the bag offers a spacious lined compartment with a cross strap to hold your items in place. These bags make premium gifts for esteemed clients. They will also make a delegation travelling as a team look smart and professional when each member carries matching bags. The listed price includes branding of your logo in a single colour print. Please note that prices exclude GST. A once off set up charge of $75 applies. The bag can be branded on the front or the back using a silk printing or transfer printing method. Provide your recipients with promotional bags they'll love to use. We offer a fast turnaround time of 2 weeks from approval of artwork and your invoice payment. We are proud to deliver across Australia to all locations, including Sydney, Melbourne, Brisbane, Darwin, Hobart, Adelaide, Perth and Canberra. Ask about direct delivery costs to any regional location today, our sales team are always happy to assist.